Happy Feel Good Friday from New York City! I know Inauguration Day may not feel very good but that's exactly why I'm in New York today. I'm picking up a friend and then heading to Washington DC to support today's FGF group, the Women's March on Washington (WMW). The election of Donald Trump has inspired people to coordinate worldwide protests on January 21, 2017 - the first day of his administration. A visit to the website of the original group, the Women's March on Washington, explains the mission of the march. "In the spirit of democracy and honoring the champions of human rights, dignity, and justice who have come before us, we join in diversity to show our presence in numbers too great to ignore. The Women's March on Washington will send a bold message to our new government on their first day in office, and to the world that women's rights are human rights. We stand together, recognizing that defending the most marginalized among us is defending all of us." 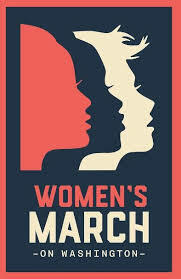 Since the original march was planned, sister marches have been organized in over 600 cities around the world! You can read this Huffington Post article about marches around the world get the full list of participating domestic and international cities here. Not only will there be marches in our neighboring countries Mexico and Canada, but there will be people marching all across Europe and as far away as Australia and Japan! Gloria Steinem and Harry Belafonte have been named honorary chairs of the DC march and supporting partners range from groups you know like the NAACP, MoveOn.org and Planned Parenthood and those inviting further investigation such as Black Girls Rock, Korean Resource Center and Lady Parts Justice. You can see the full list of partner organizations here. The WMW website is a great place to go for questions about logistics, resources and the latest updates on the march. While you're there you can also make a donation and buy a t-shirt. To stay in the social media loop like the WMW Facebook page and following them on Twitter @womensmarch. If you're feeling discouraged by the state of affairs, I encourage you to join a march in your area, or take some other sort of positive action on the 21st. Marching in the streets in a show of solidarity (and pussyhats) helps me know I'm not alone and inspires me to further action and it just may do the same for you!